Mazie Keiko Hirono ( /ˈmeɪzi hiˈroʊnoʊ/; Japanese name: 広野 慶子, Hirono Keiko; born November 3, 1947) is a Japanese-born American politician serving since 2013 as the junior United States Senator from Hawaii. She is a member of the Democratic Party. Prior to her career in the Senate, Hirono served as a member of the Hawaii House of Representatives from 1981 to 1995 and as Hawaii's ninth lieutenant governor from 1994 to 2002 under Ben Cayetano. 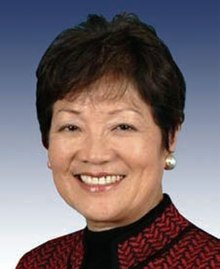 The Democratic nominee for Governor of Hawaii in 2002, Hirono was defeated by Republican Linda Lingle. From 2007 to 2013, she served as a member of the United States House of Representatives for Hawaii's 2nd congressional district. Hirono is the first elected female senator from Hawaii, the first Asian-American woman elected to the Senate, the first U.S. senator born in Japan, and the nation's first Buddhist senator. She considers herself a non-practicing Buddhist   and is often cited with Hank Johnson as the first Buddhist to serve in the United States Congress. She is the third woman to be elected to Congress from the state of Hawaii (after Patsy Mink and Pat Saiki). In 2012, Hirono was the Democratic nominee for the U.S. Senate seat being vacated by the retirement of Daniel Akaka. Hirono won the election, defeating Linda Lingle in a rematch landslide victory by 63% to 37%. Hirono was sworn in on January 3, 2013, by Vice President Joe Biden. Hirono was the only person of Asian ancestry serving in the U.S. Senate from 2013 until 2017 when senators Tammy Duckworth and Kamala Harris were sworn in, representing the states of Illinois and California, respectively. Although Brian Schatz joined the Senate a week before she did, making him Hawaii's senior senator, her six years in the House of Representatives makes her the dean, or longest-serving member overall, of Hawaii's congressional delegation. Hirono's father was a compulsive gambler and alcoholic who would pawn his wife's possessions for gambling money. Treated "like a slave," by her in-laws, Hirono said,  in 1951 Laura left her abusive marriage. The deciding moment for her had come after her brother Akira, who had returned to Hawaii after the war, had sent some money for a school uniform for Laura's youngest son Wayne, but her husband had taken it to buy an overcoat. As Laura later recounted, "My brother sent money to buy a school uniform for my son. My husband took the money, went to town and never came back home. It was getting closer to the start of school, so I went to look for him. I found out he had ordered an overcoat for himself with the money. He didn't need an overcoat in the spring. That's when I made up my mind to leave." After telling her in-laws she would be taking her elder son and Hirono to school in her hometown, Laura left the house, never to return. Selling her clothes for the rail fare, she returned to her parents' house. Laura said, "My husband never came around once; my parents were supportive and took all of us in. My mother gave us money. I guess it all boils down to love." Though money was tight and the family was forced to move often, Laura kept them together. Mazie Hirono recalled that she and her brother used to get a dime once or twice a week from their mother. "We both had baseball piggy banks. My older brother spent all his dimes but I saved mine. But one day I came home and the dimes were gone. My mother had to use it to buy food." From 1980 to 1994, Hirono served in the Hawaii House of Representatives, passing more than 120 laws. She was honored by a coalition of leaseholders as Legislator of the Year in 1984. From 1987 to 1992, she was the Chairman of the Consumer Protection and Commerce Committee. In 1994, she joined the ticket of incumbent Lieutenant Governor Benjamin J. Cayetano and was consequently elected to a historic administration led by the first Filipino American governor and first Japanese immigrant lieutenant governor. During her tenure as lieutenant governor, Hirono was also president of the National Commission on Teaching, America's Future, as well as the Hawaii Policy Group. She also spearheaded the first-in-the-nation comprehensive Pre-Plus program, a precursor to universal pre-school education in the United States. Hirono originally wanted to run for Mayor of Honolulu in a potential 2002 special election created by the vacancy of incumbent Mayor Jeremy Harris, who was planning to resign in order to run for Governor of Hawaii. However, due to internal controversies, Harris dropped out of the gubernatorial election and remained mayor for another two years. Hirono switched races. Hirono won re-election to a second term with 76% of the vote. She outperformed presidential candidate Barack Obama, a native of Honolulu, by three points. On December 12, 2012, the Senate Democratic Steering Committee announced that Hirono would serve on the Senate Judiciary Committee, giving her influence on matters ranging from approving nominations of federal judges to setting criminal-justice policy. ^ "Buddhists Get the Vote". Manitoba Buddhist Temple. November 5, 2010. Retrieved August 12, 2012. ^ Camire, Dennis (January 5, 2007). "What happened to ... religious tolerance?". Honolulu Advertiser. Gannett Company. Retrieved August 9, 2011. ^ Jonathan Tilove. "New Congress brings with it religious firsts". Newhouse News Service. Archived from the original on December 19, 2006. ^ a b c d e f Rod Ohira (May 8, 1999). "Lieutenant governor reflects on the 'bookends' of her life". Honolulu Star-Bulletin. Retrieved January 1, 2013. ^ a b c d Dan Boylan (March 21, 2007). "The Immigrant Congresswoman". Midweek. Retrieved January 1, 2013. ^ LaFrance, Adrieene (2014-01-12). "What It's Like To Be The Only Asian-American Woman in the U.S. Senate". Medium. Retrieved January 13, 2014. ^ "Mazie Hirono: From poverty to quiet power". Honolulu Advertiser. September 4, 2002. Retrieved September 23, 2012. ^ "Tari Sato". Ancestry.com. Retrieved January 1, 2013. ^ "Hawaii, Senate – Mazie Hirono". NationalJournal.com. Retrieved April 10, 2015. ^ "Mazie Hirono Biography". Biography.com. A&E Television Networks. August 19, 2015. 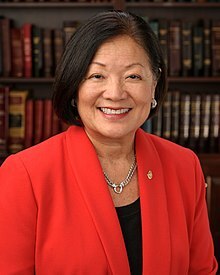 ^ "Mazie Keiko Hirono". Washington Times. Retrieved July 29, 2017. ^ "HI State House 12 Race". Our Campaigns. November 4, 1980. Retrieved June 3, 2012. ^ "HI State House 20 Race". Our Campaigns. November 2, 1982. Retrieved June 3, 2012. ^ "HI State House 32 Race". Our Campaigns. November 6, 1984. Retrieved June 3, 2012. ^ "HI State House 22 – D Primary Race". Our Campaigns. September 19, 1992. Retrieved June 3, 2012. ^ "HI State House 22 Race". Our Campaigns. November 3, 1992. Retrieved June 3, 2012. ^ "HI Lt. Governor – D Primary Race". Our Campaigns. September 17, 1994. Retrieved June 3, 2012. ^ "HI Lt. Governor Race". Our Campaigns. November 8, 1994. Retrieved June 3, 2012. ^ "HI Lt. Governor – D Primary Race". Our Campaigns. September 19, 1998. Retrieved June 3, 2012. ^ "HI Lt. Governor Race". Our Campaigns. November 3, 1998. Retrieved June 3, 2012. ^ "HI Governor – D Primary Race". Our Campaigns. September 21, 2002. Retrieved June 3, 2012. ^ Borreca, Richard (September 23, 2002). "The race is on". Honolulu Star-Bulletin. Retrieved June 24, 2010. ^ State of Hawaii Office of Elections (September 28, 2002). "2002 Primary Election Results (Statewide Summary)" (PDF). Retrieved June 24, 2010. ^ "HI Governor Race". Our Campaigns. November 5, 2002. Retrieved June 3, 2012. ^ Borreca, Richard (November 6, 2002). "'Big responsibility'". Honolulu Star-Bulletin. Retrieved June 24, 2010. ^ Giddins, Carrie. "Emily's list announces endorsement of Mazie Hirono for Hawaii's 2nd congressional District". Archived from the original on June 23, 2006. Retrieved June 14, 2006. ^ Kapochunas, Rachel. "Akaka Survives Challenge from Case in Hawaii Democratic Primary". cqpolitics.com. Archived from the original on October 13, 2007. Retrieved September 24, 2006. ^ "HI – District 02 Race". Our Campaigns. November 7, 2006. Retrieved June 3, 2012. ^ "HI – District 02 Race". Our Campaigns. November 4, 2008. Retrieved June 3, 2012. ^ "HI – District 02 Race". Our Campaigns. November 2, 2010. Retrieved June 3, 2012. ^ "Rep. Mazie Hirono". Politico. Retrieved August 14, 2014. ^ a b c d e f "Mazie Hirono on Abortion". On the Issues. Retrieved November 19, 2012. ^ "Sen. Mazie K. Hirono: Campaign Finance/Money". opensecrets.org. The Center for Responsive Politics. Retrieved November 19, 2012. ^ Strauss, Daniel (June 28, 2011). "EMILY's List backs Rep. Hirono in Hawaii Senate primary". TheHill. Retrieved May 19, 2018. ^ DePledge, Derrick (May 20, 2011). "Hirono to run for U.S. Senate". Honolulu Star-Advertiser. Retrieved June 18, 2011. ^ a b "Election Results". Office of Elections, State of Hawaii. Retrieved December 5, 2010. ^ "Hirono defeats Lingle in Senate race". Honolulu Star Advertiser. Associated Press. November 6, 2012. Archived from the original on November 13, 2012. Retrieved November 7, 2012. ^ Koh, Yoree (November 6, 2012). "Hirono Becomes First U.S. Senator Born in Japan". The Wall Street Journal. Retrieved November 7, 2012. ^ Sandstrom, Aleksandra (March 21, 2017). "Majority of states have all-Christian congressional delegations". Pew Research Center. Retrieved May 19, 2018. ^ "Hawaii Senate 2012 Race". OpenSecrets. December 31, 2012. Retrieved May 19, 2018. ^ "General Election 2018 Final Summary Report" (PDF). State of Hawaii. November 13, 2018. Retrieved November 18, 2018. ^ Jalonick, Mary Claire (September 21, 2018). "Call for men to 'step up' puts Sen. Hirono in the spotlight". Associated Press. ^ Cummings, William (September 19, 2018). "Sen. Mazie Hirono to men: 'Just shut up and step up'". USA Today. Retrieved October 6, 2018. ^ Sullivan, Kate (September 18, 2018). "Sen. Hirono's message to men: 'Just shut up and step up. Do the right thing.'". CNN. Retrieved November 18, 2018. ^ "Sen. Hirono Secures Important Hawai'i Priorities". Big Island Now. February 12, 2019. Retrieved March 19, 2019. ^ "Mazie Hirono on the Issues". On the Issues. Retrieved November 18, 2018. ^ "Mazie Hirono on Abortion". www.ontheissues.org. Retrieved 2019-01-23. ^ Pignataro, Anthony (June 20, 2016). "Hawaii Senators Mazie Hirono, Brian Schatz react to gun control bill failures – Maui Time". Maui Time. Retrieved October 4, 2017. ^ Shapiro, Rebecca (July 28, 2017). "Senator Mazie Hirono Health Care Plea". Huffington Post. Retrieved July 29, 2017. ^ Griffin, Kyle (July 28, 2017). "Personal, moving speech from Mazie Hirono tonight about her cancer diagnosis. This is worth your time". Twitter. Retrieved July 29, 2017. ^ "Democratic Senators 'Alarmed' by Shutdown's Potential Impact on Food Safety". foodsafetymagazine.com. January 15, 2019. ^ "FDA May Call Back More Furloughed Staff for Food Safety Checks Amid Shutdown". Forbes. January 20, 2019. Retrieved February 6, 2019. ^ Birnbaum, Emily (April 17, 2019). "Dems introduce bill to tackle 'digital divide'". The Hill. ^ a b Hamedy, Saba (May 16, 2017). "Hawaii Sen. Mazie Hirono diagnosed with kidney cancer". Retrieved June 3, 2017. ^ Drewes, Paul (May 17, 2017). "Sudden surgery for Senator Mazie Hirono". KITV. Retrieved June 3, 2017. ^ "US Senator Mazie Hirono Recovering After Kidney Surgery". U.S. News & World Report. Associated Press. May 17, 2017. Retrieved June 3, 2017. ^ "Hirono returns to Senate following kidney surgery with message of thanks". KHON-TV. May 22, 2017. Retrieved June 3, 2017. Totenberg, Nina (7 June 2018). "The Quiet Rage Of Mazie Hirono". NPR. Retrieved 14 November 2018. Boylan, Dan (21 March 2007). "The Immigrant Congresswoman". MidWeek. Retrieved 14 November 2018. 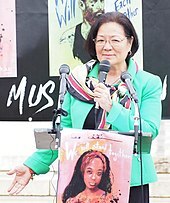 Wikimedia Commons has media related to Mazie Hirono.